“There aren’t many groups in which I work as a sideman, where I don’t have to think about putting the music together. But Ben’s Ray Davies arrangements are an exception”. So said guitarist John Etheridge, and his endorsement of bassist Ben Crosland made me want to find out more. So, after a relaxed lunch, Ben and I sat down to talk about his new album The Ray Davies Songbook, Volume II – which is released today (12 April) and launched live with a gig at the 606 Club, London on Tuesday 23rd April. It’s the follow-up to The Ray Davies Songbook (2016), Ben’s acclaimed first set of jazz readings of one of the UK’s favourite pop songsmiths. Crosland’s love of Ray Davies goes back to his school days in the 1960s. “Pop music went through this period of incredibly interesting developments, with the Beatles and the Kinks”, he explained, “and that fired my imagination”. An aspiring drummer, guitarist and songwriter, Ben had his early talent knocked into shape by an inspirational school-music teacher. He took up the bass in 1980, which suited his love of rhythm and harmony and his own personality as a team player. In 1982, his life was changed when he attended the Wavendon Summer Jazz Course. Studying with the late Jeff Clyne, who went on to be a firm friend and continuing inspiration, and other legendary British musicians, including Tony Coe, Norma Winstone and Don Rendell, was the stuff of dreams. “I came home from that course absolutely buzzing, I couldn’t wait to go the following year”. He did so for five straight years, eventually returning as an assistant tutor with Jeff Clyne. He had found his vocation. Crosland formed first jazz outfit in 1990, a quintet with Adrian Ingram, Rod Mason, Julian Longbottom and Robert Howard. He played with top-line players at Marsden Jazz Festival, recorded with Alan Skidmore and started writing seriously for jazz ensemble. 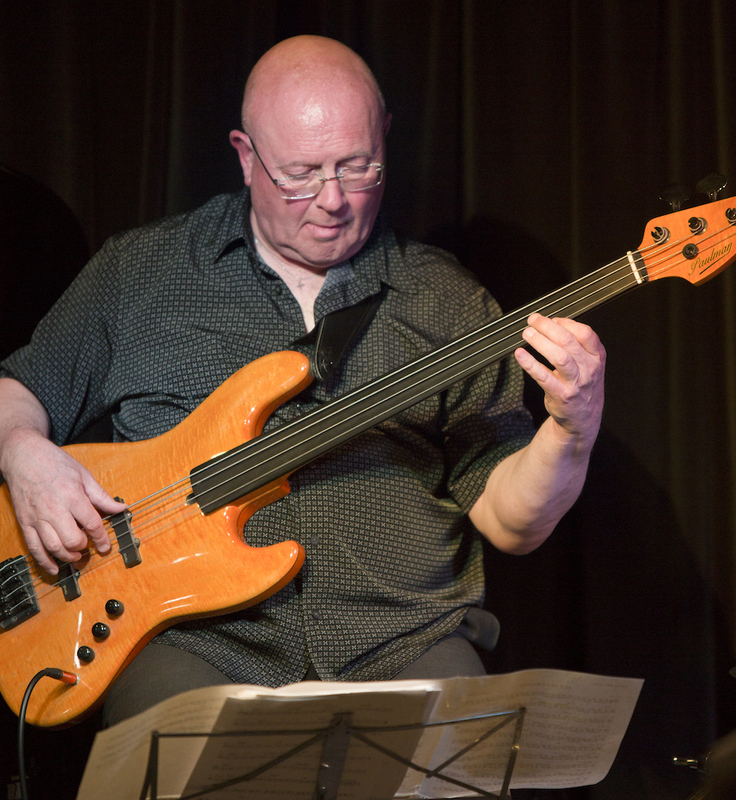 For the quintet’s 10th birthday he added Alan Skidmore, Steve Waterman and Mark Nightingale to record Echoes From The Valley for Marsden Jazz Festival, an album of original material celebrating the Colne Valley area of Yorkshire from which he hails. The octet stretched his composing and arranging skills. He drew musical inspiration from period and place – the history and sounds of the area in which he grew up – combining it with strong melody and interesting harmonies. A precursor, perhaps, of what he would later find in Ray Davies’s songs. Crosland formed a quartet featuring Waterman, Stuart McCallum and Dave Walsh in 2000. Threeway, with Waterman and Steve Lodder, was the next band, formed in 2004. It was a chamber jazz trio which made three albums of mostly original material. He is immensely proud of all these recordings, “probably the high point of my writing up to that point, because I was writing for the two Steves and Stuart, shaping material to suit their own skills and techniques”. By this stage, his natural style of composition, strong on melody but always starting from interesting and unusual harmonic progressions, was becoming his hallmark. An excursion into writing for a brass sextet with material inspired by the Yorkshire Sculpture park followed. It was at this point that Crosland thought back to his school days listening to the Kinks. As a mature composer and arranger, he could now see jazz potential in the natural swing and groove of Davies’s melodies: “Ray Davies’s music is rooted in the blues, music hall, popular song, variety and musical theatre – the perfect vehicles for jazz”. Commissioned by Barney Stevenson, the producer of Marsden Jazz Festival, Crosland began arranging Davies’s songs in 2014. His arrangements were premiered at Marsden in October 2015 and the first album was launched at London’s Pizza Express in July 2016. 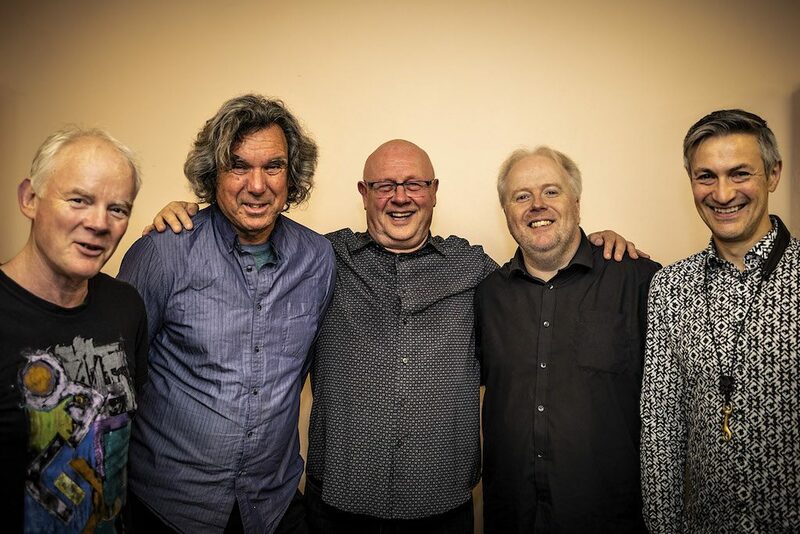 With a band of outstanding musicians – Dave O’Higgins, John Etheridge and Sebastian De Krom alongside Steve Lodder and himself (pictured above by Nick Puttick) – he suddenly found an enthusiastic audience for his homage to his 1960s pop idol. The critics agreed: according to The Times, the album “swings consistently … with this sharp, cogent collection, a dedicated follower of Ray Davies has made him a well-respected jazz composer too”. Crosland thinks the popularity of his Ray Davies arrangements is partly due to the profile of many jazz audiences, which remember the Kinks. Promoters like the “story”, too, and there have been plenty of well-received performances of the material from the first album. So how do you make pop songs work for jazz? Crosland told me that he always tries to work with the material – “to let the tunes speak for themselves, even though I might tweak the harmonies and structure. I’m inspired by the original feel of the music. I’m not trying to do something postmodern – I want to keep the original spirit but represent it in a new jazz form”. He looks for inspiration in the spirit of the original source material. For the new album, Lola had “a louche, risqué atmosphere which suggested a rhumba to me”. Till The End Of The Day seemed to call for a shuffle groove. Speaking about Ape Man, he says “The way Ray Davies sings it has a Caribbean lilt so in my arrangement the voicing of the piano called for a calypso treatment”. In his arrangements Crosland is always looking to create and sustain interest. Celluloid Heroes, “a beautiful ballad”, is introduced by Steve Lodder’s piano and bass playing in unison; on other occasions the melodies are played by different combinations of instruments. “I try to vary things – sometimes it’s bass and piano, or sax and guitar, sometimes in harmony, sometimes unison, all to create interest”. Some ideas emerged in the studio, but on other occasions he set out with a player in mind: “Steve Lodder’s solo [on Celluloid Heroes] is beautiful and I always had Steve in mind as a soloist. His introduction was improvised in the way only Steve can do. I also wanted to feature Steve on Days”. Autumn Almanac was probably the most difficult song to arrange. “It’s a long tune with different sections – it’s not just a 32-bar song – probably Davies’s most complex tune. The opening statement is quite long, in line with the original, but improvising over the whole of the sections wouldn’t have worked, so I edited the different sections to weave together an interesting and challenging chord sequence. I also tweaked the melody in one minor regard”. The marimba sound on Apeman was suggested by Steve Lodder: “That’s why I love his playing, he’s so creative. He came up with the idea, playing piano with his left hand and keyboard with his right”. Sunny Afternoon, on the first album, had a reggae feel: “That was also Steve’s idea. He was naturally able to come up with something that would enhance the music. Seb’s drum groove is so light and tasteful – it just works with the music”. Seb’s solo at the end of Dandy is typical – short, concise and full of interest. When I spoke to John Etheridge he confirmed how much he loved the rhythmic kick of Ben’s arrangement of this tune but he also highlighted the melodies. “You couldn’t imagine doing Rolling Stones music without the lyrics but with Ray Davies there is a really high melodic content and they work really well as instrumentals. They work brilliantly as jazz heads. And everyone knows the tunes so it goes really well”. John made another good point about Ben’s arrangements. “On the originals there would be a lot of rhythm guitar but Ben’s written that out. So I’m often playing lines in harmony with Dave on sax or Steve on piano so there isn’t rhythm guitar which would completely change it. With rhythm guitar it would be a simple tribute but I don’t play rhythm on the heads at all. Ben has done this deliberately to mark them off from the originals”. Crosland also praises Dave O’Higgins – not just as a great player but also for the way he engineered the album. “We recorded it in his house and did a beautiful job. He pays attention to detail and is incredibly precise”. Drawing the discussion to a close, I asked Crosland where he thought his work fits in with the current jazz scene. “In some ways I’m a bit of a throwback. I’m big on melody. Some contemporary jazz is really clever – I can’t write like that – and there are times when I simply can’t hear a tune. I try to write appealing, but interesting, music. Perhaps I’m looking back to the classic period of jazz. I try to be myself”. Ben Crosland Quintet: The Ray Davies Songbook Volume II (Jazz Cat 117) is released today.